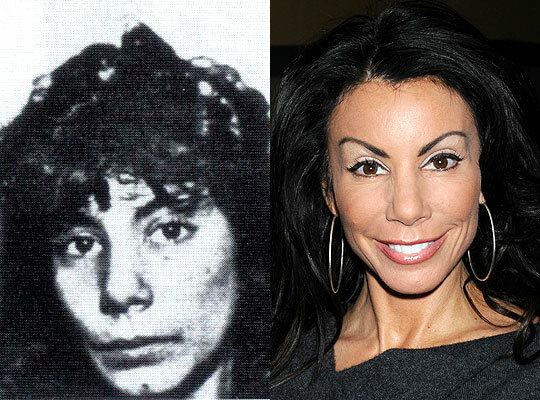 Danielle Staub before and after plastic surgery. Here we have the easily irritable and almost always unpleasant former Real Housewives of New Jersey, Danielle Staub, showcased in a before and after photo which highlights the drastic transformation that rendered her the nickname "plastic chipmunk". We only kid about the nickname, but in all seriousness, Danielle Staub has truly taken on a new form, since the above mugshot photo was taken in 1986, however the only plastic surgery procedures shes fessing up to is botox and multiple breast augmentations. Despite these modest confessions, Ms. Staub is also rumored to have undergone a few more drastic modifications, including a nose job, mini facelift and cheek/chin fillers. Regardless of how much plastic surgery shes endured, the fact of the matter is, we probably won't be seeing much of Danielle Staub on television anymore, after being booted from the Real Housewives of New Jersey series, amid rumors that her fellow castmates would not return to the show unless she was axed. This looks like Jasmine Guy...........Sick. Sorry this is Bruce Jenner.